Dan Wiart is the Partner in charge of consulting, internal audit and special projects at Kingston Ross Pasnak LLP in Edmonton, Alberta. Working primarily as a consultant, his practice focuses on projects outside the scope of traditional accounting and assurance services; including business case development, forensic accounting, internal control reviews and assessments, value for money/operational audits, performance measurement program development, public-private partnership (P3) evaluations, financial modeling and analysis, risk assessments, business plan development, due diligence procedures, enterprise risk management, performance based audits, financial projections, strategic planning, financial oversight, special reports, and complex financial calculations. 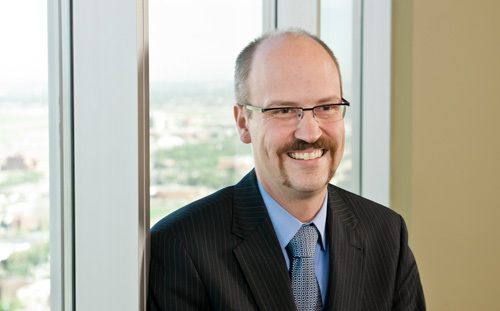 Dan obtained his Bachelor of Commerce degree, majoring in accounting, from the University of Alberta in 1996 and began his career at KRP in the assurance and accounting department, where he attained his Chartered Accountant designation with the Alberta Institute. From there, he specialized and moved to the business valuation and litigation support department where he attained his Chartered Business Valuator designation. Dan’s practice is now focused on consulting, internal audit, and special projects where he has furthered his studies and became an associate member with the Association of Certified Fraud Examiners in 2006 and a member of the Institute of Internal Auditors in 2011. Dan Wiart has over twenty years of experience in forensic accounting, audit and assurance, business valuations, internal audit, and consulting. He has worked with a wide array of organizations in various industries; including government, infrastructure, manufacturing, forestry, corrections, transportation, real estate and land development; of various sizes from small privately owned companies to large government entities and public companies listed on internationally recognized stock exchanges. With each project, he is focused on providing clients with a tailored solution to meet the specific needs of their organization. Developed a business case to assess alternative plans to redevelop a large campus of government facilities. Completed a feasibility assessment for the development of a large office/institutional campus development. Developed RFP criteria and assessed proposals for a new civic transportation development. Developed financial models and budget analysis for a large residential/commercial neighborhood development. Prepared a business case, including risk assessment and cost/benefit analysis to support the construction of a provincial training centre. Created a business case to support telecommunications system upgrades for Public Works and Government Services Canada. Preparation of cost/benefit analysis, private-public partnership (P3) risk transfer quantification, and general financial consulting to support the construction of a government office tower. Prepared financial capacity assessments on behalf of the Government of Alberta for proponents interested in building a school under a public-private partnership (P3). Preparation of cost/benefit analysis for inclusion in a business case supporting the renewal of a number of large Government of Alberta databases. Prepared cost/benefit analysis to support the business case for the development of a new correctional centre. Prepared cost/benefit analysis to support a business case examining various potential service delivery methods for University of Alberta facilities. Prepared cost/benefit analysis to support the business case for the development of a provincial communications system. Completed a feasibility assessment for using a public-private partnership (P3) to develop a new provincial training centre. Assisted Alberta Infrastructure with developing accommodation plans for office space in Fort McMurray, Edmonton and Calgary. Lecturer on Occupational Fraud Risks and Prevention. Completed a forensic investigation for a large retailer quantifying $500,000 in losses due to cash skimming by the company’s bookkeeper. Qualified as an expert witness and testified in the Provincial Court of Alberta Criminal Division. Completed due diligence for the purchaser of an oilfield services company. Completed due diligence for the purchaser of a metals fabrication company. Completed due diligence for an investor in a private equity venture fund. Provided forensic accounting services on account transactions to determine reasons for decrease in marital assets post-separation in a matrimonial dispute. Completed a forensic review of executor reporting for purposes of an estate dispute. Completed a forensic review report to investigate allegations of misuse of the assets and resources of an oilfield service company by a foreign division’s manager. Completed a forensic investigation of allegations of approximately $2 million in inflated disbursements and unauthorized asset transfers from a construction company to other corporations owned by the company’s minority shareholders. Completed a forensic review report and quantification of loss for a trucking company due to allegations of unauthorized salary and purchases by the company’s bookkeeper. Qualified as an expert witness and testified in the Provincial Court of Alberta Criminal Division. Completed a forensic investigation of a real estate broker who was allegedly misappropriating trust funds to finance his personal operations. Assisted a promotional products company with the quantification and eventual recovery of over $400,000 in cash that was misappropriated by the company’s accountant through cheque fraud. Completed a forensic accounting report and quantification of loss from allegations of unauthorized salary and the payment of personal expenditures through the corporation, and other defalcations by the minority shareholder of a hotel corporation. Acted on behalf of the Government of Ontario to complete a forensic review of expense recovery billings from a contractor in relation to a large infrastructure construction contract. Lecturer on Canadian public company regulatory compliance requirements post Sarbanes-Oxley (SOX, CSOX). Prepared a consultation report to improve internal controls at a recycling company. Assisted with improving internal controls at the foreign subsidiary of an Edmonton-based oilfield service company. Conducted an internal control review at a labour union. Performed an internal control review at a government-sponsored health services organization. Conducted an internal control assessment for a travel agency and tour operator. Performed an internal control review for a large home builder. Assessed internal controls over financial reporting (ICFR) to support CEO/CFO certification to conform to Canadian Security Administrator requirements for a publicly-traded oilfield services company. Assessed internal controls over financial reporting (ICFR) to support CEO/CFO certification to conform to Canadian Security Administrator requirements for a publicly-traded distribution company. Prepared compliance audit reports for private companies and government-sponsored organizations to test compliance with government regulations. Facilitated enterprise risk management (ERM) sessions for a large Government of Alberta agency. Facilitated project risk management sessions for the construction of multiple new public health facilities in Northern Alberta. Development of a financial pro forma and design of investment structure for the construction of a large multi-disciplinary medical services facility. Created a financial forecast for the first year of operations of for a start-up publicly-funded provincial training centre. Development of a financial projection and business plan for a start-up company in the recycling industry. Prepared a monthly financial forecast model for a large industrial manufacturing company. Developed a monthly financial forecast model for a lumber mill. Financial analysis to support a proposal to support new methods of funding for Alberta schools. Prepared an independent assessment of the reliability of a forecast model for utility infrastructure development for the City of Edmonton. Performance of organizational and productivity reviews for companies in a variety of industries. Documentation of business processes of a publicly-traded oilfield services company to support a new enterprise management software implementation. Mergers and acquisitions consultant for individuals buying and selling businesses. Provision of interim financial management services to companies in the distribution, construction products, construction, retail and public service industries. Provision of human resources consulting and placement services for a variety of small businesses and nonprofit organizations. Assisted a professional association with assessing and selecting accounting software to support a system upgrade. Represented Edmonton-based hotels in property tax appeals. Preparation of numerous business valuations for private and public companies. Preparation of numerous expert reports quantifying economic damages in personal injury, fatality and breach of contract actions for purposes of litigation support. Prepared complex financial disclosure calculations and reconciliations, according to Canadian Generally Accepted Accounting Principles (GAAP), for public companies. In 2005, he was the recipient of the Premier’s Award of Excellence for his involvement in the development process for a major provincial infrastructure project. In 2009, the Alberta Institute of Chartered Accountants awarded him with its Early Achievement Award, recognizing Alberta Chartered Accountants who have demonstrated exceptional achievement in professional, civic, charitable, community or other service, and/or excellence, innovation or remarkable accomplishment in their career or the field of accounting.